Every school boy or girl has learnt about the peasants revolt at some time during their history lessons. These days it’s usually when they’re in Year 7 (11-12 years old). History can sometimes feel a bit staid and unreal if you just read about it in a history book but today we got up close and personal with a real piece of history from medieval times. We went on a walking tour around Sudbury in Suffolk, a small town near where we live. The tour was generally about Sudbury and it’s various residents, there was a lot about Thomas Gainsborough the artist who lived there in the 18th century and the silk weaving industries which the town is famous for. There are in fact 2 silk mills still in production today, Vanners and Walters and the tour took us past Vanners and to some of the old silk weavers cottages. At the end of the tour however, we came to the real reason why we’d down the tour. We’d learnt a few years ago about the head of Simon of Sudbury being kept in St Gregory’s church. Simon was born in Sudbury in circa 1316. He had various roles during his life including, Bishop of London, Archbishop of Canterbury and Lord Chancellor of England. He had also helped to found a college in Sudbury and a lepers hospital. In the early summer of 1381 however, A group of artisans and officials from Brentwood rose up in protest against demands to pay the hated poll tax. They also had other demands such as the end of serfdom ( a kind of labour where you are tied to work for a particular manor or lord). Simon had helped to introduce this poll tax and so it was on 14 June 1481, peasants stormed into the Tower of London where Simon was and murdered him by chopping off his head. It allegedly took 8 blows of the axe to remove his head. His body was sent to Canterbury Cathedral but his head was placed on a spike on London Bridge for a while, a notorious place for traitors heads to be placed. The head however was taken by friends of Simon back to Sudbury. Simon (another not the original!) who showed us the head was keen to point out that it was technically a head rather than a skull as it still has pieces of mummified skin on it. The head is kept in a little wooden box in a wall within the church that can only be accessed with permission. An old note about the head is kept with it. We had seen a programme a few years earlier where the head had been take and a bust recreated of what Simon had looked like , just as they do with modern day murder victims. They had also confirmed that the head had indeed been removed with an axe and we got to see the original bust. Outside the church is an area of land called the croft which our guide claimed many of the peasants from the revolt were buried under. Although I don’t know how true this is as we only have her word to substantiate this. The church of St Gregory’s itself is very lovely, with a beautiful medieval door and a lovely font cover dating to the 15th century which raises up on a pole when the font is needed. We didn’t hang around long after our tour as it was a bitterly cold day, so we headed off shortly for a warming cup of coffee but it was fascinating to get up so close to real history. My aunt and uncle had invited us to help their village celebrate 100 years since the end of WW1 and we were very excited to be taking part in an armistice celebration. The event took place in the Ellen Petit memorial hall, on the high street, next to the Swan pub. The event was completely free for the public and our services were of course for free too. We arrived bright and early about a quarter to eight to set up. The hall was starting to look splendid with flags, poppies and various displays connected to WW1. We had bought a random selection of our artefacts and objects along to represent the soldiers and the nurses who treated them. Our first customers of the day appeared just before ten and the event was set to run till about 1pm. I must admit in my mind I had wondered if it would just be a handful of people over the day, but from 10am till close we barely had a chance to sit for more than a few seconds. It was lovely to meet so many people from the community, particularly so many older people who had some interesting stories to share about their parents or grandparents. One gentleman had brought along the original letter written by a Captain of the war to his family, explaining the sad circumstances of the death of his uncle who had been a Lewis gunner in 1916, which was an interesting fact as we had believed previously that they weren’t used till 1917 but there was the evidence in front of us. Another lady there had a display set up about her grandfather and her journey to find out about him, which was so similar to my own. Sadly we were so busy that we never had time to go over and look at her stand. Rousing WW1 tunes played over the speaker as we chatted to the public. The day started with many older people but gradually as the day went on, more children had appeared. They had spent time in school painting poppies which were displayed in the hall. Of course there was the ubiquitous British tea & cake too and we’d like to send a huge thank you to everyone there for supplying us with so much tea. Magic cups of tea and pieces of cake kept appearing, including trench cake which was something that the soldiers would have been familiar with. It was made with out eggs but vinegar instead. I could imagine many soldiers at the front being very pleased to receive a parcel from home with trench cake in to make a break from their usual rather boring rations. Everything would be shared fairly by the soldiers with their mates. If someone received a cake, it was shared by all. The most popular object on our display, I think was the prosthetic leg that we have. It meant so much to people to see something like that as it really helped to bring home the realities of war. Along with the pieces of shell fragment, along with our newly acquired shell. It helped people to understand a little more of the horrors that the soldiers had to go through. It was an honour to see a couple of real soldiers attending the event and Wel was honoured to be asked to have a photo taken with the WW1 sculpture and the real sergeant. The day went so quickly, I half wish it had gone on a bit longer as it was so lovely to chat to everyone. Such a special effort had been made by everyone there. The villages memorial will continue today with various events. I woke up on 20 October 2018 to the sound of church bells pealing at 7am in our B & B in Cagnoncles. I was too excited to hang around any longer so we set off early towards Briastre. A thick mist choked the land and it was hard to see more than a 100ft at best in front of us. It was easy to imagine all those soldiers standing out there, a 100 years to the day returning to the spot where they had fought and fallen. Perhaps the fog would have reminded them of another type of mist seen on the battlefields. Poison gas was mistaken for mist or smoke on it’s first sighting. It gave a very eerie start to the day but a very atmospheric one. ‘For marked gallantry and determined leadership. He was in command of a company, and under heavy machine-gun fire, dashed forward with a few of his men, shooting several of the enemy with his rifle and capturing the guns. Later, finding that the company on his flank had not reached its objective, he led a platoon and attacked the enemy on his flank. His gallantry and good leadership was the cause of success during a very difficult advance’. This advance took place on 20 October 1918 in the early hours of the morning. They had amassed the evening before and were ready to go by 1AM. We decided that we would visit the mayor’s office. Every town and village in France of any size has one and we hoped we might be able to draw on some local knowledge. The people were very interested in what we were trying to ask. A gentlemen whom we thought was the mayor came forward to speak to us but it was a lovely lady called Valerie who kindly translated for us in the end, whose father had been English. Together everyone in the office piled around our books and info and helped us to locate where Jack had won his MC and whether it was accessible. The railway cutting he had crossed, which had been the first part of his MC had long since gone it seemed and the ravine did not exist as it once had done and was mostly inaccessible. Valerie kindly agreed to hop into the van with two British strangers and take them to the point where we could access the MC site. We can’t thank her or the people of Briastre enough for this it would have been extremely hard to pinpoint the area without their help. ravine, railway cutting and sunken road which proved very useful. In the distance we could see the local farmer on his tractor quiety ploughing his fields. I read aloud some of the info of the attack that happened there and found my self feeling very emotional and choked, so much so I couldn’t finish reading the passage. We walked round the other side of the field and came across the railway cutting that he had crossed. Jack had written ‘Our part was the deepest part’ and indeed it was very deep. The 2D photo doesn’t convey at all how deep it was. A cross was beside the edge of the ravine but we had no way of knowing who it was for. It wasn’t a miltary gravestone. We carried on and found a railway bridge and the bottom part of the ravine. But we were still a little confused at this point about where the sunken road was, it wasn’t quite making sense yet. We made our way back to the van, which was parked next the villages military graveyard, it was kept spotlessly clean and about 8 tenths of the graves were members of the Manchester Regiment. I read and photographed every grave and pondered whether any of them had been Jack’s friends. It was a lovely spot, looking over green fields and towards slowly turning turbines in the distance. We had our lunch here in the van overlooking the cemetary. sky lark sung his sweet song above our heads. It might sound silly but it felt to me like those bells were ringing in recognition and confirmation that we had at last found our spot. The story was complete. Oddly the photo of the sunken road from 100 years ago looked very similar, even down to the sign that was there. In the distance I could see the ravine he’d crossed, in the other direction was the steeple of the church in Solemnes, just as in the original photo. I felt that I had honoured my grandfather and his regiment by returning to this spot. You can read about history in a book but there is nothing like walking it, no history book can convey the depth of a ravine crossed, the colour of the earth trodden or the magical feel of a place. Of all the days in my life this will be one of my proudest. I have just returned from one of the most special experiences of my life. I have literally trodden in the footsteps of my grandfather who was an officer during WW1 and visited the site where he won his medal 100 years ago on 20 October 1918. I never knew my grandfather as I was only a toddler when he died in the 1970s, so sadly I have no memory of him. I learnt a few years ago from my aunt that he had received a military cross for bravery during WW1. At the time a distinction was made between bravery acts of the everyday soldiers such as privates who won a military medal and those of officer class (many were public school boys) who won the MC. Jack was born John Morton Scott Jupp on 17 October 1897 and so he was underage at only 17 years old when he joined up on 26 March 1915. Initially he was part of the Artists Rifles where he would have received training to be an Officer. He was stationed in England at the start of the war but was transferred to the 2/10th Manchester Regiment (42nd East Lancashire Division) and was sent over to France in the early Spring of 1917. One of Jacks first requests from his family was for a diary and he started keeping it in March 1917. It’s a very brief diary with little great emotion or detail but it was a great starting point for me to have some research done on Jack to find out more about his time in the army. We set sail for Dunkirk, France on 18 October 2018. I had butterflies in my stomach as I saw the white cliffs of Dover receding behind me. I wondered how he must have felt. Was he worried about the submarines below him or the battles yet to come? After we arrived in Dunkirk we travelled across the border into Belgium to visit the grave of a man that my grandfather had mentioned in his diary, Sergeant G Archbold. On the 9 September 1918, he had tried to swim across the Yser Canal from the British side to the end of the Jetty on the German side to attach the Union Jack Flag. Sadly he failed and was swept away. He was found a few days later and buried at Ramscapelle military cemetery. A report of the incident was made in some papers at the time. If you believe in such things, please say a prayer for his soul for me and all the other brave members of the Manchester Regiment who died here. We found his grave and paid our respects, then moved onto the canal where it happened. This was basically the northern most point of the western front and the canal was ‘No mans Land’. My grandfather had also mentioned a plane that had come down at the end of the jetty, from which a machine gun was retrieved. In an original photo taken at the time, the wooden base of this jetty is very clear. Today, many new flats and shops have been built near the spot but it’s still very recognisable from the photos , Nowadays however it is full of people undertaking more peaceable pursuits such as fishing & sailing. We then moved on to Bray Dunes where Jack had some R & R with his friends. Bray dunes is many hectares wide and I had no way of knowing exactly where he had stood but it was amazing to stand in the same area a 100 years on. I knew he had been here as it’s recorded in his own diary that he was billeted near here and in the battalion war diary. A photo also exists of Jack and some of his officer friends, obviously enjoying some R & R as there is a beer bottle in the photo and they all look very relaxed. I only wish I knew who the other officers were. Jack is on the far left of the photo. The next day we made our way down towards Cambrai in France, via some of the villages that Jack had stopped in. They were nice to visit but gave very little feel for the war so we decided to visit some of the WW1 museums in the area. We found a fantastic little museum in Bullecourt. A local farming couple had dug up many items on their land over the years and donated their finds and the museum for future generations to see after they had died. There was even the remains of a WW1 tank. Next we went on to the Wellington Tunnels in Arras, a fascinating piece of history. Originally they were Roman and medieval quarries which had been expanded by the allies, particularly the New Zealanders to create an underground complex with the intent of surprising the enemy. We had Tommy shaped safety helmets to wear and descended down into the tunnels. We had an amazing young guide who flipped constantly between French & English and explained the history of the tunnels showing the many marks left behind. Just as in the trenches many tunnels were named after places back home to make it easier to find ones way around. The intention was to blow open the tunnels and launch a surprise attack of 24,000 men against the Germans with a diversion happening further down the line. It worked too but sadly the troops received no back up and they were told to wait a day which gave time for the Germans to reinforce. One has to wonder why. As you might be aware from reading my blogs, crafting is one of my other hobbies and when crafting and history meet, I’m even happier! 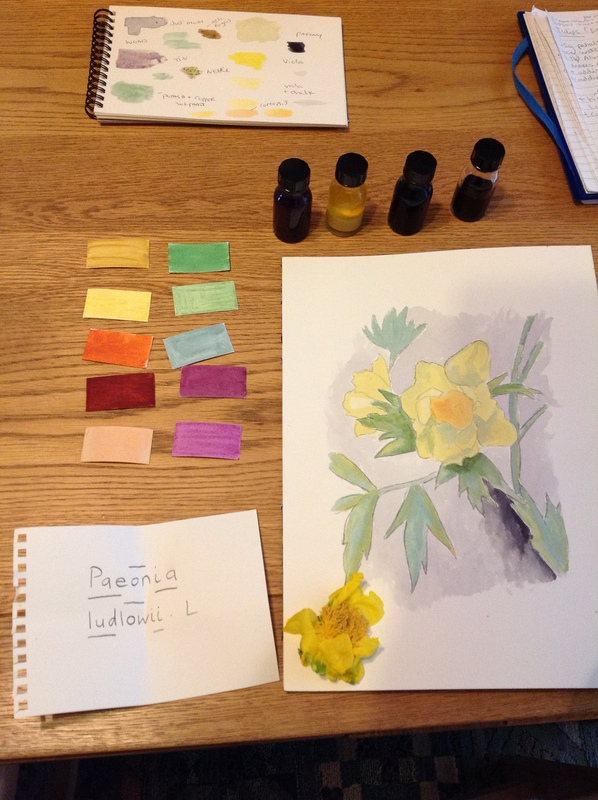 This week (May 8th & 9th 2018), I attended a 2 day workshop on how to make natural inks and paints from plants at the Botanic Gardens in Cambridge. The course was run by artist Nabil Ali and I think was one of the best workshops I’ve ever done. We started the first day by looking at some of the historical texts that mention the making of inks. These included texts from Roman times, through medieval and even a recipe to make oak gall ink by Sir Isaac Newton. We looked briefly at how to make our own charcoal from willow or peach stones. Willow can be put in an old biscuit tin with holes in the lid and heated for a couple of hours. Using peach stones for charcoal was mentioned by Cennino d’Andrea Cennini a 15th century Florentine artist in his book ‘Il Libro dell’ Arte’ but Nabil told us to beware as burning the stones gives off poisonous arsenic, so must be done outdoors!!! We then moved on to one of the most famous of natural inks, oak gall ink. The earliest reference to the use of oak gall ink was fom a very old formula written by a Greek called Philo of Byzantium (280-220 BCE) and Nabil told us oak gall ink was used right up to the 1970s in Germany. It is made from a growth on oak trees caused by the gall wasp. Nabil showed us 3 different types of gall, the Portugese gall was huge, the Turkish gall was the next biggest and then the British gall, which is quite small. Newtons recipe for oak gall ink was made with ale and Nabil had tried recreating his recipe but didn’t find it to be a good one so we used wine to make our ink. Oak gall ink is very permanent and in a previous workshops where I’d used it on vellum, I was unable to completely scrape the ink off the page. This is due to the high tannin content in the ink. For this reason Nabil told us that it was often used in legal documents such as laws, so that the script could not be altered or changed in any way. Modern British laws are still printed on vellum for archival purposes as vellum (prepared calf skin) can last a 1000 years or more. Number of oak galls (say 6 for example) x 12 = the amount of wine needed in grams (so for 6 galls that would be 72grams of wine ). We also needed to add gum arabic to the mix. GA is a tree resin from the Acacia tree. It acts as a binder in the ink. The binder helps the ink stick to the paper and disperses the pigment through the ink. The weight of gum Arabic that we needed was the same weight as the oak galls. Once all this was added to the pan we heated it up on an electric portable cooker ring to reduce it down for about 20-30 minutes. The GA made the ink froth up so it is important to only half fill the pan. We then added iron sulphate to the pan. Iron sulphate is a mordant used in the natural textile dyeing industry. In the textile industry a mordant would be used to help fix the colour in when washed but although this is not so important for inks, the mordant did help to bring out the colour of the ink. Nabil preferred to call them additives. Grapefruit seed extract can be added to the ink in a 1% ratio to help prevent mould. This was done in a well ventilated room so the fumes from the alcohol or the additives weren’t overwhelming. The left over galls can be dried and crushed and will give a dark brown pigment. This beautiful mountain pansy gives the most wonderful yellow colour and was next on our agenda. To make it we used 50 ml wine, 50 flowers and a teaspoon of aluminium sulphate (alum) as a mordant. Again it was allowed to reduce for about 20 minutes or so. To change the colour from an ink to a paint, 3g of chalk dust was added. This acted as a filler. Yellows are the least stable colours, Weld makes the most stable colour. Be careful, these additives can be toxic and should not be allowed near children. So ink making should be done outside or in a well ventilated room. Don’t stand over the pot too much. We used purple iris flowers next to make an ink, Nabil asked us what colour we thought it would yield and were surprised to find that if alum was used as the mordant and chalk as the filler, it gave a lovely green paint. It was made in a similar way to the oak gall and viola ink by reducing the liquid down by about half once the onion skins were added to the wine. Then adding the alum and then chalk if you want paint rather than ink. Nabil told us about making madder paint. Madder is a root from the plant ‘Rubia Tinctorum’, which is part of the coffee family. It is used in dyeing and can also be used to make an ink/paint. Nabil said it was important not to let the mixture boil but to keep it to 60-70 degrees, or it releases a brown from inside the root. This lovely bush is covered in pink flowers in the spring, which the bees absolutely love and we’re lucky enough to have one in our garden. It’s official name is Ribes sanguinem. The currants are the part that’s used and can yield a blue paint. When mixed with soda it gives a blue, with potash it gives a purple. Potash and chalk gives a purple/grey. Mixing with tin gives a lovely magenta. Tin & egg shells gives a lovely pale lilacy colour. Ruta Graveolens (Rue) is a lesser known herb, getting the juice on the skin can cause terrible skin irritation, so gloves need to be worn to handle it. It is mentioned in the Montpellier ‘Liber Diversarum Arcium’, a medieval handbook of painting from the early 15th century. When mixed with verdigris, rue will give a lovely turquoise colour. Verdigris is the lovely green that you see on old copper. Nabil explained that verdigris can be made by suspending copper plates over vinegar in a sealed container. The copper will verdigris in a few weeks. Care should be taken though as verdigris is poisonous. To make the ink put fresh leaves in a mesh bag and whilst wearing protective gloves, squeeze the juice out. Then add a teaspoon of verdigris. This makes ‘historic green’ and it is a very stable colour. Personally I’m not sure of using this, some artists lick their paint brushes and I can’t image that could be good! Artists beware! We are all familiar with elderberries here in the UK, I’m not sure how widely spread they are around the world. It’s a wonderful bush/tree. The flowers yield elderflower cordial and wine. The berries can be cooked and eaten, made into crumbles and sauces. They should never be eaten raw as there are toxins in the berries. I have also now found out that they make great ink and paint too and surprisingly produce a green colour. However if alum and chalk are added, it will yield a purple. This colour will fade quickly. This lovely yellow flowered plant yields a red colour. Like dyeing different additives will give different colours. If mixed with chalk and GA it gives a terracotta colour. If mixed with aluminium hydroxide it yields a deep orange. With bicarbonate of soda it gives a deep reddish orange. Reduce to 30g then add 1 tsp of potash. Using mineral clay (cat litter) as a filler yields a grey/yellow. Adding fillers makes the colour much paler. It made a coffee brown colour which when china clay was added made a biscuit type colour. Adding potash to it made a dark grey/green. Adding chalk as filler gives a pale green. Adding potash makes a darker green. Adding tin makes the purple more vibrant but adding chalk will make it turn green again. Cat litter as a filler gives a browny colour. These were something that I had collected myself many moons ago. I had tried to make a medieval herb garden once and woad was one of the plants I had in it. I found out that it is tremendously good at self seeding and I collected thousands of them. I eventually, for reasons I don’t understand now eradicated the herb from my garden but I still have a large wooden tub of seeds. Nabil let me have a go at making an ink from them. This ink I got to cook up myself as they were my seeds. A good handful of seeds was added to the pot and some wine in similar quantities to the oak gall ink. I was expecting a blue colour as I knew what colour woad gives in dye vats and indeed we did have a grey/blue. We tried various test samples. When we added alum to the ink we achieved a purple colour. When we added potash as the additive we achieved a green. By adding copper unsurprisingly we had turquoise. Adding tin made it stay purple. I used some of this ink recently in my calligraphy class and found it to be quite a pleasant ink to work with. It was perhaps a little thin but presumably adding less wine/water to the mix would make a thicker ink. The perfect ink for calligraphy should be like a thin cream. I normally use gouache, which is easier to adjust if it starts to get too thin but I am trying to cut out plastic and cut down on waste generally so it struck me that this might be a good zero waste alternative to my usual paints. I was pleased to see that this was going to be one of the inks we were looking at as it grows in my garden in abundance. It freely self seeds everywhere and I never have the heart to pull it up from all the cracks that it likes to seed in. I’d used it before to make ointments as it’s very soothing for the skin. To make this ink we used 7 g of flowers, 100g water, 10g of alum, 3g of tin and 3g of powdered chalk. It gives orange or red when mixed with dragon’s blood & gesso (Dragon’s blood is a plant resin). To sum up, it was an amazing course, worth every penny, if I’m honest perhaps under-priced. There was lots to do, learn and keep us occupied throughout the 2 days. It opened up my eyes to the paint palette that is just waiting for me in my own garden. It probably sounds naïve but I had no idea before this course that so many colours could be made from plants. I certainly hope to make more paints in the future and I hope that if you’ve read all this you might give it a go too. We have just returned from attending the 30th SHP teachers conference in Leeds this year. We were feeling a bit frayed around the edges having been working away from home for the best part of the last month. If I’m honest, having been a little unwell recently in Cumbria, I just wanted my own bed and own things around me but we were extremely pleased we made the effort to attend as we have returned enthused and rejuvenated from the inspiring environment it provides. We met some old friends, such as Anglia Tours, who I spoke about in last years blog and Ian Dawson, former Director of the SHP who so kindly let us attend that first year back in 2005. We also made some new friends too. We spoke to lots of teachers and attended various lectures. It was great to find out that others had similar experiences whilst teaching and to find new ideas of how to teach. this gentle knight was buried here. This seems to be a popular theme in medieval stories and put me in mind of the story of 3 dead kings. Reading these lines whilst standing next to their effigies, made me feel quite a profound connection to them. Even as someone who is uncertain of life after death, I found myself praying for their souls, because, it was what they had believed and wanted. Sir Richard had died in 1500 but reading this contemporary poem had bought me a little closer to him. This in essence is what the workshop was about. It is easy to forget sometimes that children don’t have the years of life experience we all have and they can struggle to relate to people that died a long time ago. There is a widely held belief that people in the past were stupid as they don’t know what we know and we have always rallied over the years to change this way of thinking. Mary showed us a photo of Skara Brae, the Neolithic settlement in the Orkney Islands. Mary asked what questions this photo bought to mind but we were of all of course, as adults, approaching it with a knowledge of exactly what it was and what life was like then. One of her pupils when shown the same photo had said “But where do they plug in their ipad charger?”. I had many times had similar responses from students. “No electricity? But how did they watch TV?!”. The concept that there was a time before television just didn’t exist in their mind. The workshop moved on to ways of using contemporary culture from each period to help the students achieve a sense of period and understand the way that the people thought. She used things such as The ballads of Robin Hood, which were very enlightening. I learnt more about Robin Hood than I ever knew before, and found out in particular the scathing views of the church hierarchy at that time. We looked at various other suggestions, such as the use of WW1 music hall songs, which helped to show how attitudes to the war changed from year to year. It made me wonder if the WW1 postcards I own would be a valuable teaching resource. I already have some letters on our website sent to my granny during WW2, which openly show the feelings of her friends and relations on a range of subjects. It was a well presented and thought provoking workshop. We had this year decided not to bring so much stuff to display and not to dress up in costume, instead opting for our work t-shirts which clearly showed who we were and what we did. I wish I had more time to put thought in to what else to bring but it has been such a busy year. We made some new friends this year too. We met Hannah from the Thackray medical museum in Leeds. We had visited the museum some years earlier to chat about possible work and we had a look around whilst we were there. The thing that stuck in our mind most was a very early video from the early 1900s of an amputation being performed. Hannah had bought some curious artefacts from the museum for people to identify, which included a beautifully engineered cork press and a mid 18th century tooth pelican. We also met David & Dickie from Frontline Living History who had an amazing stand full of wonderful original WW1 items. They provide WW1 workshops in schools like us. I was fascinated with Dickies medical items in particular, the history of medicine has been a keen interest of mine ever since I worked at the Royal Society in London. Some of Dickie’s items were particularly special as they belonged to his (I think) great grandfather who had been a surgeon during WW1, this included his military surgeons kit and sword. His whole family had been surgeons or doctors and he was also a trained modern day army medic. He helped satiate my never ending thirst for medical knowledge by talking me through the wonderful artefacts. We talked about the great advances in medicine during WW1 and also he enlightened me of some of the new advances brought about in modern wars, such as the modern version of the first field dressing which doesn’t absorb blood but instead stops it from coming out in the first place. It sounds so obvious when you think of it. One of my favourite quotes from a student I once taught was “What will people think about us in a 100 years time?” Indeed, if we think back on the great advances in medicine during the last 100 years or so, blood transfusion, antibiotics, heart transplants. What wonders might the future yet hold? David also very kindly helped me in my quest to find out more about my own grandfather John ‘Jack’ Jupp, who was only 17 when he joined up during WW1 and was an acting Captain by the end of the war. He had received a military cross on 20 October 1918 at Briastre, for capturing 2 machine gun nests. My ambition is to visit the spot that this happened in October this year. David was searching for trench maps so I could locate where he might have been based, sadly there wasn’t one, which he worked out was probably due to the late stage of the war, only being a few weeks before the end. But I shall write more about Jack if I make it there later this year. I have found out since that he too made his own pilgrimage to France to find the grave of a relative who had died in the war. And so with a few hand shakes and farewells we said goodbye to friends old and new and hope to return next year. While we sometimes moan about the very early ups in our job (4AM quite often), it is nonetheless a very varied job and there is never a chance to be bored. The favourite part of my job is creating a new display. Our latest project is a pirate display for schools, it’s something we’ve thought about for many years and finally decided to turn our attention to as we reckon it’ll be great fun. One of the aspects that we’re going to cover is the kind of food that sailors and pirates might have to live on. In the age of sail when everywhere was a long way from everywhere else, access to constant fresh supplies would have been difficult and voyages could be very long. They needed to find ways to store food long term. Until tinned food was invented (by the French) in the early 19th century, one of the most important foods was ships biscuits (which became known as hard tack later one). These were basically 4oz unleavened rolled sized savoury bread biscuits that had been baked to within an inch of their lives, to drive out all the moisture. I’m not going to go into the history of the ship biscuit here as Jas does it so well, I recommend watching the video. This page is more about my experimenting with having a go at making them. The recipe he gives is a little loose by modern standards which outline every ingredient to the nearest gramme but I’m used to making bread so this didn’t phase me. I started by measuring out 2lb of wholemeal flour, to which I added half an oz of salt. This is about the same amount I’d normally use to make the same quantity of leavened bread. If you were baking them purely for show, I suppose you could use more to help preserve them longer, although they will last a long time on their own. Normally at this juncture I would be adding dried yeast to just over a pint warm water and mixing it in. I think I added about 2 thirds of a pint of cold water to make, as Jas suggests a stiff dough. The amount you will need will depend on your flour, different flours will need differing amounts. Normally in bread making, you don’t want too tight a dough or the bread won’t rise very well and you end up with a dense loaf. I’m lucky enough to have a Kenwood Chef with a dough hook attachment. I used to knead all my dough by hand and I know how to do this well but in all honesty its so much easier with the machine, I let the machine knead the dough for a few minutes, until it had all come together and formed a cohesive dough that I could roll out. I had already greased a couple of baking trays, so the next step was to divide the dough into 8 equal portions. Although I used 2lb of flour which would have yielded the suggested 4oz portion (there are 16oz in a lb), as salt and water had also been added the pieces weighed more than this. I kneaded each piece a little more, formed it into balls and rolled it to about half an inch thick and placed them on the baking tray. I then pricked the top as Jas suggested. I didn’t have the lovely wire fork that he used so my tool was a cake decorating tool. The heat range that he suggested cooking at worked out between 130 to 160 C on a fan oven like mine, so I chose 130 C as my oven seems to bake quite hot. I then baked them for 3 hours, checking them regularly. The final result was a little surprising as the biscuits had risen slightly in the oven. Happy in my ignorance I hadn’t thought this possible without yeast or some other sort of raising agent. I don’t know the science behind this but I put this down to natural yeasts in the environment. I used to make sourdough bread, which is closer to bread that was made in medieval times. Bakers would either keep a piece of the dough from the last batch as a starter for the next or they would use yeasts skimmed off during the ale brewing process. You can make your own sourdough starter, which uses the natural yeasts in the air but it is a slow and in my experience unsuccessful process (my starter I used regularly came from my teacher). I was therefore aware that there are natural yeasts around but didn’t expect the biscuits to rise at all as I’d not left the dough for any great length of time. Once baked the biscuits were left to cool. They are extremely hard and made a dry knocking noise when tapped. Wel was keen to try one to see what it was like, he picked the fattest biscuit. He tried eating it with his teeth but this wasn’t possible so he cut one in half and then tried dipping it in soup. This sort of worked but the biscuit was still very hard. Jas mentioned that they were dipped often in sack (fortified wine), brandy or wine or ground up like flour and I can quite understand why. It was not an enjoyable eat and we didn’t finish eating the whole biscuit. The biscuit we chose was still a little moist in the middle. For my next batch I will roll them thinner and bake them on a slightly higher temperature to ensure that they cook all the way through. I will probably bake this lot again, which fits with the term biscuit which means ‘twice baked’. Their final weight was still more than 4oz but this may be because I made them too thick and they still contain some water but overall I was pleased with our experiment. Start the year as you mean to go on, is a saying one often hears. Our year has started with a visit to the National Maritime Museum in Greenwich. We were visiting to undertake some research for a possible future nautical related display and gain some inspiration. We arrived in Greenwich quite early at 9.30am as we wanted to secure our parking for the day and the museum was not yet open. As we waited outside the front of the museum we came across a sort of memorial to the crew of the Franklin exhibition, it was very peaceful there at that time of day. As we approached we could hear the sound of waves crashing and in front of us on banners were the names of the 129 crew who died on Franklin’s expedition to find the North West Passage. It was quite a moving memorial. I’d been fascinated with the story since the 1990s when I owned a book about mummies, which included photos of 3 of the crew who had died early in the mission and were buried on route. Their perfectly preserved bodies were found in 1984, still with whiskers, clothing and even eyeballs intact. The cold conditions had worked as a freezer to perfectly preserve their bodies for all that time. The discovery of a north-west passage was a 19th century obsession as it would have meant an immense boost to trade if there was a quicker way to get to the East. Franklin set off in May of 1845 with enough provisions for 3 years. Sadly it was not meant to be and most of the crew who set off from England died (A few were sent back for some reason). Many expeditions were sent to try to find Franklin and his crew. A few of which found clues but no trace of the ships. That was until 2014 when explorers following the information that the native Inuit people had provided finally found the wreck of the Erebus. Terror was found 2 years later. The words of the Inuit had been discounted in the 19th century by many people, most famously by Charles Dickens. The exhibition is a masterpiece and wonderfully conveys the tale of this ill fated expedition. Unlike our 19th century ancestors it is respectful of Inuit traditions and knowledge. There are replicas of Inuit clothing and a canoe to view as well as tools that they use and some that were made from abandoned items they found from the expedition, metal and wood being scarce resources in that part of the world. The story is told through many personal objects, and opens with a single shoe of a crew member found on one of the wrecks. It is displayed against a moving underwater scene. There are many other personal objects of the crew, dinner plates they ate off, cutlery, tin cans, the surgeons medicine chest, even a piece of meat. The most poignant and moving objects for me were items taken from the graves of the 3 crew members found in 1984, John Torrington, John Hartnell & William Braine. Photos of them as they were found were very respectfully displayed next to each other with items from their grave, part of the shirt sleeve of one, the scarf that covered the face of another etc. It felt very moving to be so close to these objects that were so personal to those crew members and had been buried with them for so long in the ice. To see the individual stitching and the weave of the material are something that no photo can convey. It conveyed very respectfully a sense of what it must have been like standing at those grave sides as they were buried and later discovered. One of the other very touching objects in the exhibition was a letter written by a family of one of the missing crew to their son. They still had hope that their son was still alive. It was immensely moving to read their words of hope knowing now the fate that he befell. There was an interesting section on what may have killed the various crew members and how various diseases like scurvy & tuberculosis may have affected them. It’s also thought that lead poisoning either from their food tins or water supply may have killed many as many of the corpses found contained high levels of lead. This section also included the doctors medicine chest. The exhibition also covered the various expeditions that tried to find Franklin and a section on how the ships were found in 2014 & 2016. The exhibition started in July 2017 and only runs now till the 7 January 2018, so if you want to see it, you’d better get your skates on and get down to Greenwich this week. If you believe you are a descendant of one of the crew of the Franklin expedition, DNA research is currently being carried out to find out who the skeletons found in the region belong to. Your DNA might help name them and fill in an important piece of the puzzle. You never know, it might also help lay a few ghosts to rest at last. Crime is fast becoming one of our specialities and on Tuesday, Wel was running our 18th century crime & punishment trials at Colchester Castle in Essex. Some of you might be familiar with our medieval crime & punishment trials, which Wel has run innumerable times, portraying a medieval sheriff. In these 18th c trials, Wel plays a bewigged and bespectacled magistrate. Crime, the law & some of the punishments had changed a lot since medieval times. During the 18th century, broadsheets (like the Sun newspaper of their day) had whipped people up into such a frenzy of fear about crime that the number of crimes which carried the death penalty dramatically increased. In reality, the crime rate actually fell during this period. In 1688 there were only 50 crimes that carried the death sentence (bad enough you might think! ), yet by 1815, 225 crimes could be punished by death. Crimes such as arson, poaching, forgery, even cutting down trees could lead to execution. The name given to the English legal system at this time was ‘the bloody code’, because of the high number of crimes which could result in the death penalty. We ran the trials in the Charles Gray room, which we had used many times before for other displays but it seemed to lend a wonderful presence to the proceedings. Behind Wel stood a stone fireplace dating to 1500 and a wonderful carved wooden mantelpiece dating to about 1600. We were also allowed to use a piece of furniture in the room for Wel to stand behind, which gave an air of authority. The room started to fill up quickly and very soon an audience of about 50 people filled the room. We were immensely pleased as a large audience always makes for a good atmosphere. The room filled with hush as Wel called for order in the court. Various cases were brought before him, notorious highway robbers, body snatchers, anglers and thieves. Unlike a modern court, in the 18th century the defendant had to bring forward witnesses and character references and should be able to prove his innocence of the crime. Almost a ‘guilty until proven innocent’ scenario which is the opposite of the way that English courts work nowadays. The 18th century trials are always very exciting for Wel to run, as we never know what the audience will do in response to their accusations or what character references they will bring forward. Sometimes complete strangers in real life are brought forward as character references or as alibis for the defendant, who very willingly often testify to the defendants innocence and good character! In other cases a true son will say his mother is of bad character. I’m sure that this happened in the real cases too. The defendant in an 18th c trial did not yet have to swear on oath that what he was saying was the truth, unlike the witnesses he brought forward. An 18th century jury would be made up of moneyed and land owning men, as this would preclude a large part of our audience, our jury was made up of men, women and children. As was the case at the time, our jury’s were generally speaking very lenient and death sentences were commuted to transportation instead (about 70% of cases). There were several things that a defendant could do to help themselves. A woman could ‘Plead her belly’, in other words state that she was pregnant. If this was proved to be true, she could not be hanged as the innocent life inside her would also die and the child would need a mother once it was born. They could also plead ‘Benefit of clergy’. This was a hangover from medieval times, originally designed to protect the clergy but by the 18th century any first time offender could read the ‘neck verse’ which could save them from being hung. It involved reading Psalm 51 from the bible in Latin. The psalm starts: ‘Miserere mei, Deus, secundum misericordiam tuam (“O God, have mercy upon me, according to thine heartfelt mercifulness”). Many people, even the non literate memorized the verse to use but if it was found that they were not clergy, they could be branded on the thumb with a “T” for theft, “F” for felon, or “M” for murder), so that they were unable to obtain this benefit again. In some cases, they were even made to read other parts of the bible to prove that they were not clergy and get round this loophole. They might also appeal to the king for leniency in their case who could also commute their punishments. At the end of the trials, the convicted were taken down to the castles original 18th c prison cells for their punishments and to obtain a small feeling of what it must have been like for the prisoners kept there. Last weekend we were running our medieval milling display at Dover Castle in Kent. As part of the display we bake some medieval breads to show the public so on Thursday last I set about baking some of the breads that we need. As nowadays, there was a vast array of different breads in medieval times, although not every bread was available to every pocket. Wheat bread was largely a preserve of the wealthier folk of society. The whiter the wheat bread, the higher status and more costly it would be. The flour would have to be sieved several times to achieve a fine white flour. The rich had various different loaves, manchets a type of large roll were the first bread that I baked. I used a recipe from Peter Brierly’s wonderful book ‘Cooking & dining in Medieval England’ although Elizabeth David also has a recipe for Manchets in her 1977 book ‘English Bread and Yeast Cookery’, hers is for a richer recipe requiring butter and milk. Her recipe is a modernised version of a 17th century recipe for manchets by Lady Arundel. The dough was wonderful to work. Although I learnt to make bread purely by hand, I admit to cheating and using my Kenwood mixer as I was making such a quantity of bread, to save me time and my muscles from getting tired. I then finished off the kneading myself. It was a wonderful dough to work with and it rose beautifully. It’s enticing smell filled the house and when they were baked, we could not resist cutting one to try. It was absolutely delicious and ‘Mmmm’ was the only noise to be heard as we munched on the still warm buttered bread. Next I made ‘Cheat’ bread. Cheat was made from wheat flour that had the worst of the bran (skin of the wheat seed) sieved out. Again I used a recipe from Peter Brierly’s book. It was also a nice dough to work and rose tremendously big. The recipe used a modern dried yeast as brewers yeast which was used commonly in medieval times to make bread is not easy to obtain and I had recently lost my sourdough culture through lack of use (reason being I am intolerant of gluten). The main difference between using modern yeast and sourdough yeast is that the rising process takes longer and it imparts more flavour to the bread. The slow rising breaks down the gluten in the bread more and is therefore supposed to make it more digestible than dried yeast loaves. The recipe required 3lb (1.4kg) of flour so you can imagine how big the loaf was. It is the loaf at the back of the basket in the photo above. That took most of the morning, so after lunch I set about making ‘Maslin’, a bread made from a mix of wheat and rye. I found no recipe in my books for this, the only guide being in E Davids book that it would be made from 85-90 % wheatmeal. I made my loaf however on a 50/50 ratio of flours and it produced quite a nice loaf, though rather denser than the wheat loaves. I was used to working with rye and wholemeal as generally when I make bread for myself, these are the flours that I use. I went through a phase of making sourdoughs after a course I attended but it was hard to maintain a sourdough with my job, although my teacher did advise that sourdoughs could be frozen and suffer no great harm. The dough was much looser and less formed than the wheat loaves. Next, the final loaf I made was horse bread. Horse bread as the name suggests was originally made for animal use but when times were hard and the crops were failing this too could become a bread of the poor. It was made from peas, beans or whatever else was to hand such as bran. The dough was more like a paste, I added a small amount of wheat flour to make the bread stick together more it was a curious sticky dough and reminded me of the first story I wrote at secondary school for my English teacher, which was called ‘A nasty sticky mess’. As I used pea flour, it was a wonderful vibrant green colour. There was very little in the way of rising and the loaf it made was small and dense. I tried a piece that broke off but it was very unpleasant to taste. I could see that it’d keep you alive but it afforded no pleasure to the taste buds. The pea used in medieval times was the field pea, a close relation of the garden pea. Yellow split peas are a modern 19th century invention to remove the outer skin. I admit to buying my rye loaf as it was a sourdough and I could not have made a better loaf than a sourdough. Rye was one of the main bread grains for the poor. Although in the north of England, oat and barley were favoured. Oat cakes being a northern speciality. On Saturday morning, we trundled down to set up for the weekend. The bread looked beautiful set out in its basket with ears of the different grains surrounding it. We also brought along various different grains and the flours that they make to show everyone. Some years back we had a woodturning friend of ours make some bowls for the display with the names of the various seeds and flours. We also had our ‘horrid things you’d find in medieval bread’ box. This displays some of the things which either went in by accident or on purpose by millers and bakers to bulk out the flour such as sawdust or chalk. A dishonest baker would suffer the punishment of being dragged around the town with a loaf of his bread around his neck so that all might see he was a dishonest baker. We also have an enlarged model of what the grain weevil looks like. The adult female chews a hole in a grain and lays a single egg. The larvae then grows and feeds on the inside of the wheat berry. I once made a loaf of bread without realising that weevils had got into my flour, the bread tasted awful!! There was opportunity too to make flour on our hand quern. Making flour this way is a curiously satisfying thing to do and the children were fascinated by it. Many coming back several times throughout the two days to make more flour. The only damper on the weekend was the atrocious weather, heavy rains on Saturday and gale force 6 winds on Sunday, which did not mix very well with flour making!